Playing host to the National Special Olympics (SO) in Antigonish, July 31-August 4, 2018, was a first for Nova Scotia. 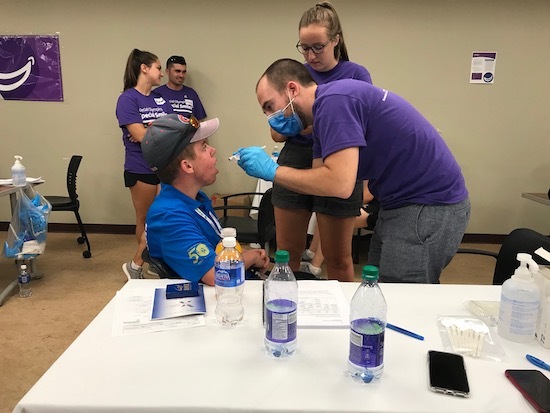 It was also a “transformative” and “life-changing” new experience for a volunteer team from Dalhousie University’s Faculty of Dentistry who were there as part of the Special Olympics Healthy Athletes program. Paediatric dentistry professor and Healthy Smiles clinical director Dr. Tracy Doyle recruited over 40 dentistry and dental hygiene faculty, staff, alumni, and students to spend some of the hottest days of the summer in a room at the Schwartz School of Business at St. Francis Xavier University. 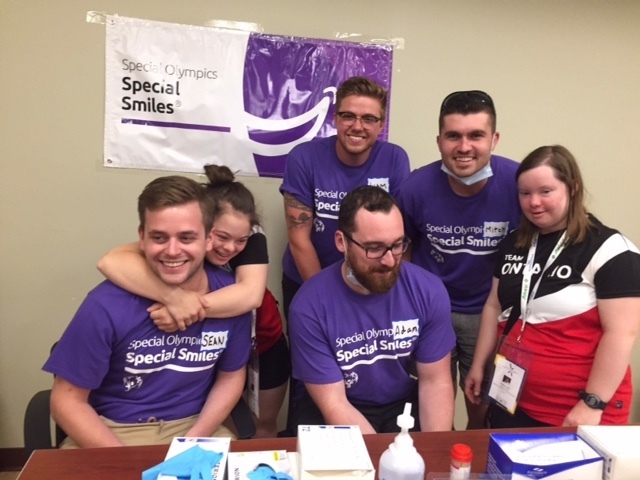 Their job was to carry out oral health screenings, make mouthguards for the athletes who needed them, provide fluoride treatments, offer oral health care education, and send every athlete away with a goody bag of oral health supplies. Other Healthy Athletes teams from Dalhousie provided vision, audiology, and podiatry checks. “Individuals with intellectual and physical challenges have a lot of unmet health needs,” says Dr. Doyle. Over the course of the four days of the games, more than 1000 athletes with autism, Down syndrome, and other intellectual disabilities passed through the Healthy Smiles room. They arrived in ones and twos, usually with their coaches. And then whole teams descended, galvanizing every available volunteer into action. In one afternoon alone, over 300 athletes were seen. 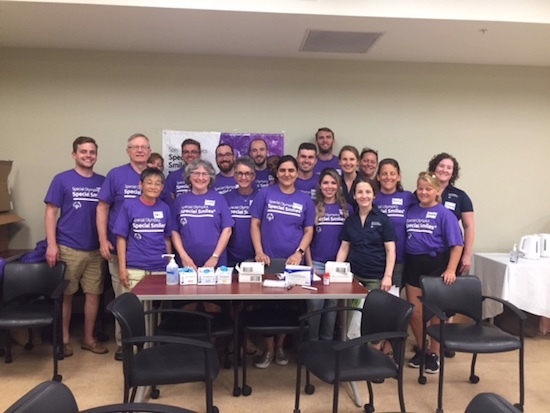 For the volunteers, it was an opportunity to witness at first hand the impact of dental health care coverage across the country. The volunteer team found that the athletes were generally well looked after in terms of cavities and decay, but the level of hygiene was concerning. Retired faculty member Dr. Greg Jones had experience of large-scale screening programs in the Arctic with Inuit health services. He feels that the multidisciplinary approach is valuable for everyone involved and that the students in particular benefit from looking after patients they would not normally see in the Faculty clinic. The Nova Scotia winter Special Olympics will take place in Aldershot in February 2019 and there are many volunteers from this summer’s games who are inspired and keen to do it all again.